That siding! You’ve seen it. The one that looks like brick-shaped wall paper that has the texture of roof shingle. Sometimes it looks like stone rectangles, sometimes like roof shingle, instead of like brick. It comes in all kinds of colors. Why would someone put roof shingle material all over their house? As with aluminum or vinyl siding, people covered old wood clapboard or singles with siding that didn’t need painting. These asphalt singles maintained their color, year after year, and didn’t need to be painted. 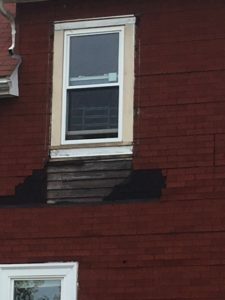 What are the problems with this kind of siding? This siding was used beginning around 1904. Many houses in eastern Massachusetts were built when this siding was a common building material. It went out of style. If you have it on your house, it is old. If it gets damaged, you are unlikely to find a matching replacement tile to patch it. 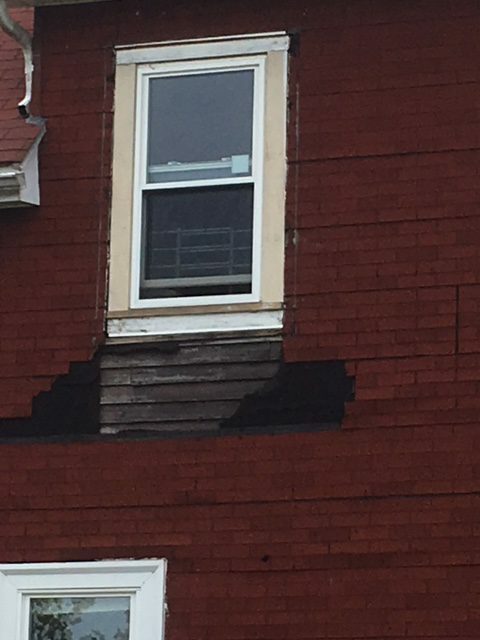 If your siding was manufactured between 1930 and 1970, it might have asbestos in it. If that is so, there are precautions you need to take if you remove it. What does it cost to replace a whole house’s siding? A lot.